The following post is an expanded and edited version of a G+ post I shared a few weeks ago. I’m sharing it here for other tabletop enthusiasts and designers who might be interested in attending a future Boston Festival of Indie Games. I’ve finally caught up on sleep after BFIG. In some ways, one day of travel feels a lot more hectic than a weekend of travel, especially when combined with the feeling of being “on” and alert the entire day. We set out for the event at 6am from western Mass, and arrived home around 11pm. Joshua A.C. Newman was a real champ about driving and navigating Boston, and it was great to have Evan on board. In retrospect, I think it’s a good idea to do trips like this in two days if you’re traveling a distance. It was a really good day, but there was understandable crankiness towards the end. By the time we left, we’d been in “go go go” mode for 12+ hours. We were pretty delirious with hunger, and we still had to battle it out with Saturday night parking and long restaurant wait times in Cambridge. BFIG was a first for all of us, and a double first for me and Evan, as this was the face-to-face Questlandia debut. Despite some pre-event confusion, everything seemed clear and well-organized when we arrived. 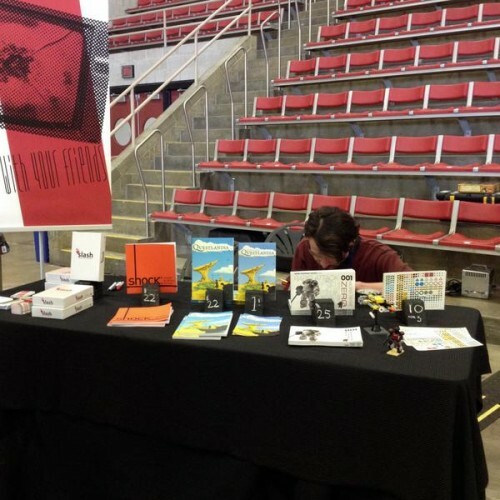 We had a nice table on the perimeter of the space (a large MIT gymnasium) and relative freedom in setting up our booth. The BFIG organizers and volunteers were super helpful—almost comically so. Whether it was lack of coordination or just plain friendliness, someone stopped by every few minutes to check in. There were info booths set up in key locations and an organizer was never far from reach. It was clear that a concerted effort was being made to create an inclusive environment. That part is key for me. I felt safe and supported at BFIG, and it was good to see women, people of color, and non-binary folks represented among the organizers and attendees. I wish I’d been able to experience more of the actual event. There were only three of us at the table, and I was treating Questlandia like a newborn baby without a sitter. I think we’d all have had a saner time if we’d taken a lunch break, but as first-time exhibitors, it was hard to break away. Despite not having the chance to demo other games, there was some really cool stuff on the floor. Joshua picked up a clever little magnet game and everyone was buzzing about a group coordination game that uses 30 sand timers to mimic the chaos/choreography of the restaurant business. Neat! The tabletop room was separate from the digital room, so I didn’t catch a glimpse at any video games. I heard it got a little steamy and overcrowded with all the electronics and alien makeout simulation. Overall, we did great sales for one day. I’m happy about how things went, and now that we know what it’s like, I think we can do even better next year. We had a good laugh about it, but we also wondered how it might be impacting sales. How many people passed by our table because they assumed we just had prototype games? How many people had come to the event assuming you couldn’t buy anything there? 2. From what I could tell, we were the only people at BFIG with tabletop RPGs. There were lots of board games and card games, but a number of people stopped to talk with us who had never heard of roleplaying games before. It was fun talking with these folks, but I’d love to see more representation from the indie RPG community next year. Would I go again? You bet! It was fun, our sales were good, and it was relatively low-prep and low-stress. My only complaint is that I’ve experienced a bit of weird post-BFIG spam. Okay, spam might be a harsh word. A number of people followed me on Twitter, tweeted to me about their games, then quickly unfollowed me when I didn’t respond. I also received an email from [unnamed developer] thanking me for playing their computer game (which I hadn’t played and had never heard of) and inviting me to check out their Kickstarter. This person/company had clearly picked up business cards with the sole purpose of spamming people about their game. Emails like that really bum me out. It not only guarantees that I’ll never purchase your game…it also guarantees that if your game comes up in casual conversation, my only association with your company is unsolicited spam. Don’t do that devs! Nothing too egregious, but annoying and insincere. But I don’t want to end on a curmudgeonly note! BFIG 2014 was a great experience. The event was smooth, well-organized, and fun. I had a great time as an exhibitor, and everyone who stopped by our table was all smiles.